When it comes to modern business, the simple truth is that it takes the three greats to succeed: people, ideas, technology. In that exact order. Great teams develop great ideas and they need great technology to deliver with accuracy, ease and scale. But anything great is few and far between, and it’s often easy to miss. Recognizing great technology partners has never been more difficult. Consider the Chiefmartec landscape pictured below. This categorization of marketing technologies is released every year. Between 2014 and 2015 the number of technologies doubled. The developers actually call out on their website that you need to download a hi-res version to even read it. There are now nearly 2,000 tech companies listed and there are many more out there that didn’t make the cut. 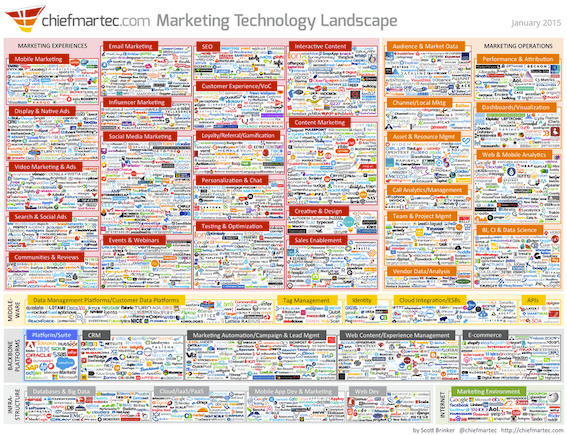 Another shocker from Chiefmartec: as a marketer you’re most likely using 100 technologies already. That includes everything, even the “ambient” technologies like Google search, so when you stop and think about it, it’s not that off base, but still a bit frightening. But just like customers, the Pareto principle, or law of the few applies. You’re most likely going to see at least 80% of value coming from less than 20% of those technologies. With thousands in the market and thousands more in development, just how do you choose? We asked ourselves that question and had a great, simple idea: solve the problem. 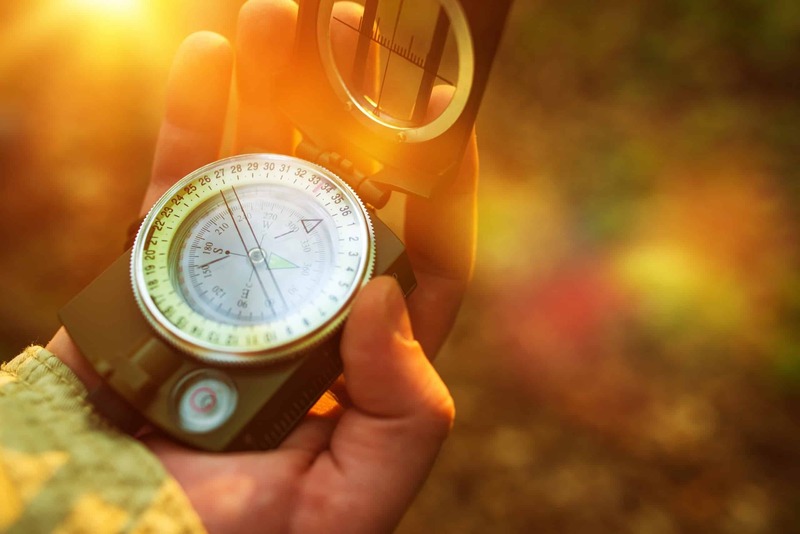 So, we created Sailthru Compass to help enterprise media and mid-market ecommerce companies navigate the sea of solutions. Ecommerce:Backend platforms like Demandware, hybris, Magento and Shopify, so that you can easily integrate data and attribute events to individual users within the Sailthru platform. User Acquisition: Tools like Janrain, Opt-Intelligence, Gigya and SumoMe, to allow our customers to acquire new users at scale and immediately begin personalizing the user experience. Events/Behaviors: Through partnerships with on-site behavior tools like Bounce Exchange, clients can trigger Sailthru marketing campaigns based on any on-site behavior. These technologies ensure messaging and timing are contextualized by cross-channel activities. Content: In the world of marketing, content is king, but sometimes creating and producing original content can be a challenge for businesses. The content category offers partnerships like Klick Push and Newscred to ensure clients not only have enough content, but the right content to put in front of their customers. Point of Sale: A key to optimizing for customer lifetime value is making sure all current and historical user purchases are tracked and attributed properly. Through integrations with tools like Tinypass, clients can ensure that their purchase information is tracked properly in the Sailthru platform. Email Optimization: Sailthru offers a market leading email platform and these partnerships make our emails even more relevant and effective by offering tools that impact how email is delivered or rendered. These include deliverability tools such as Agari as well as email optimization tools like Kick Dynamic that drive conversions faster for customers. Multichannel Consumer: The Sailthru platform natively reaches users on web, email and via some mobile channels. These partnerships offer clients a way to reach the their individual users via channels that are not native to Sailthru, such as retargeting on Facebook or via SMS like Beepsend or Twilio. You may wondering, where’s data collection and management? Personalization? Automation? Email? Predictions? Well that’s where Sailthru has you covered. We’re more than just one solution, we’re a single platform built so that you can better understand your individual customers and then engage them based on their individual preferences – in terms of both content and channel. And now with Compass, we’re so much more.